Two of the 3 charming bedrooms overlook the shaded courtyard and patio and the Rome Room enjoys a private terrace on the first floor, making it the most romantic of the three. All of the air-conditioned rooms are en-suite and there is WiFi throughout the building. 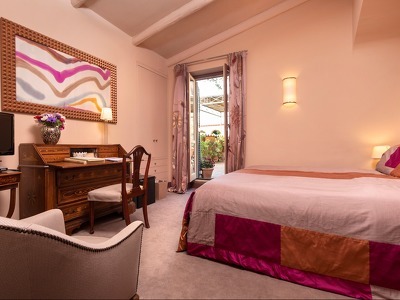 Renovated with elegant silks and satins painted by owner Luisa Longo this room evokes the colours of the Roman sunset. It has a big private terrace where you can unwind and, weather permitting, enjoy breakfast. From the top, you can enjoy the view of ancient Roman houses with pretty terraces and internal gardens typical of Trastevere known everywhere in the world as one of the most picturesque neighbourhoods in Rome. The en-suite bathroom has a shower and the king-size bed can be made up as twins. The Chocolate Room is perfect for those who like to have a large king size bed and a bit more space - the colours are soothing and blend beautifully with the courtyard flowers. This room is on the ground floor and has access to the patio. The en-suite bathroom has a shower and a bath. The Tinto Room is a perfect room for friends to share - with king-size or twin beds it has direct access to the patio. Defined by its simplicity and understated elegance it has Bohemian details and the walls are covered with early 19th-century hand painted aquarelle prints of national costumes from around the world. The writing desk has a lampshade akin to the headdress of the moor of Venice and the satin cream, pebble and sage handmade bed cover is crafted by Luisa Longo, as is the wooden bed head. The en-suite bathroom has a bath and shower. Buonanotte Garibaldi is a homely and luxurious boutique B&B in the medieval quarter of Trastevere, just a few minutes walk from the Vatican, Rome. 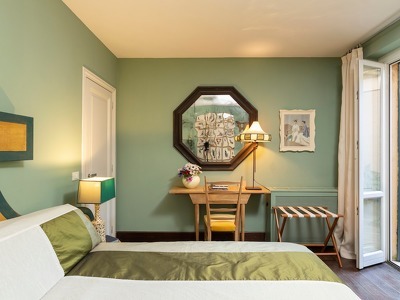 This small boutique hotel is filled with owner Luisa's art and her creative eye and love for colour have created stylish and warm interiors throughout. Luisa Longo is a talented artist who has transformed this studio into one of Rome's best-kept secrets and a favourite amongst journalists and celebrities. Private guided tours of Rome can be arranged and you're welcome to visit Luisa's studio to admire and even buy her art and hand-painted fabrics. Enjoy a quiet moment in the courtyard with a glass of Prosecco or relax in the sitting room filled with art books and other coffee table books. Rome is full of some wonderful restaurants and there are plenty nearby Buonanotte Garibaldi to choose from. Breakfast is taken in Buonanotte Garibaldi's dining room which is lined with Luisa's works of art. Credit card details are required at the time of booking. 14 days or more prior to arrival, no charge. From 14 to 7 days prior arrival: 1 night charge. From 7 to 3 days prior to arrival: 2 night charged. 3-0 days prior to arrival or no show: entire reservation will be charged. Check-in: 2:00pm to 9:00pm the day of arrival. Late check-in: 9:00pm to 12:00am with Euro 25 surcharge. Check-out: no later than 11:00am on the day of departure. Stylish and Arty. Great staff. Perfect Location for a shirt stay in Rome. 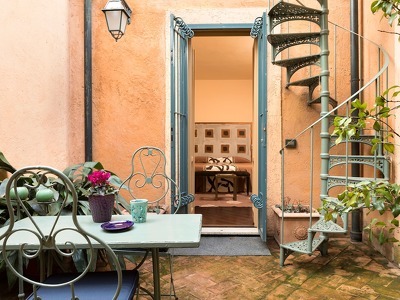 Charming B&B in the heart of Trastevere. Absolutely suggested.